The Anglers Arms - Accommodation in Morpeth The Anglers Arms is a family run Traditional Northumbrian Country Inn set on the banks of the river Coquet. Dating back to the 1760's the Anglers Arms is full of nice little touches and quaint bric-a-brac, the walls are full of pictures and fishing memorabilia and for the winter days the open log fires are a welcoming treat. 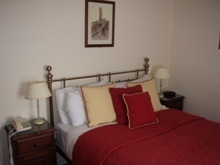 Our bedrooms are attractively furnished and all have en suite shower rooms, colour televisions, tea/coffee facilities and direct dial telephones. The warm and friendly ambiance of The Anglers Arms results not just from the attention of management and staff, but from those nice little touches one finds at every corner: ornaments, antiques, quaint pieces of bric-a-brac - including some wonderful hand-painted wall tiles - and interesting items of fishing memorabilia. The popular bar meals are 'English Country Inn' at its very best, and you can dine al fresco on those sunny summer days! As a delightful alternative, dine in style and sophistication in the A La Carte Pullman Railway Carriage. Weddings and functions are catered for in our spacious function room, and with our wedding licence, you can even hold your own wedding ceremony at The Inn. No wonder visitors return again and again to The Anglers! The Anglers Arms is a four star, traditional Northumbrian country inn set on the banks of the River Coquet. Dating back to the 1760's the Anglers Arms is full of antiques and quaint bric-a-brac. On winter days the open log fires are a welcoming treat!